Hamed Homayoun in his first concert tour in the United States. 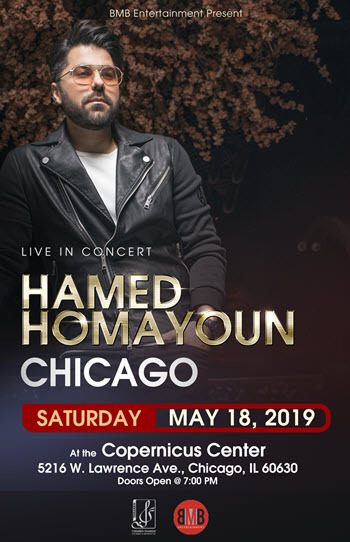 He will perform one concert in Chicago on Saturday, May 18, 2019 at the Copernicus Center. Since Hamed started his professional singing career in 2015, he has performed in over 300 concerts worldwide. His “Wet Umbrella” single has been played for over 47 million times on internet, making it the most heard Persian song in the history of Iranian music. He has performed in front of sold out crowds in most cities in Iran and other international cities like London, Manchester, Koln, Hamburg, Frankfurt, Stockholm, Gutenberg, Amsterdam, Antwerp, Yerevan, Sydney, Brisbane, Melbourne, Montreal, Toronto, Calgary, And Vancouver. In 2019, his concerts span 7 cities in the United States. His Chicago concert will be followed by a performance in New York on June 15th.